Düsseldorf parade is in a politically incorrect Mardi Gras Monday class all its own. unpleasant "armpit of evil" found in Iran. party in a most unusual manner. according to this Rosenmontag parade float? Mardi Gras Monday in Germany, the Monday right before Ash Wednesday called "Rosenmontag" by the Germans, is famous for the huge crowds that gather in Mardi Gras ["Karneval" in German] bastions like Aachen, Cologne, Düsseldorf and Mainz to watch the traditional parades. The Rosenmontag tradition dates back over a century, and the parades are known for creative float designs that often poke fun at political leaders – domestic and international – and developments on the world scene. In recent years Düsseldorf's Rosenmontag parade has earned the reputation of producing the most biting political satires among its many parade floats. This year's parade lived up to that reputation, with a couple of floats likely to be considered a bit too brazen even for Mardi Gras humor. An example of a typical Rosenmontag view of the world situation was a Düsseldorf parade float showing U.S. President George Bush reacting to the repulsive smell of Iranian President Ahmadinejad's armpit. The German word for "armpit" ["Achsel"] is only one letter different from the word for "axis" ["Achse"]. The play of words relegated the nuclear-muscled Iranian President to the "armpit of evil". 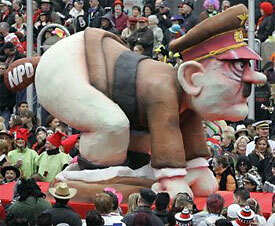 Another Düsseldorf float theme crossed an unspoken line by depicting former German dictator Adolf Hitler. Hitler has his pants down and is in the process of defecating the ultra-right "National Democratic Party of Germany" [NPD]. The NPD has its largest following in the former East Germany, where unemployment and discontent run high. However, with its xenophobic terminology and unprofessional antics in the Saxony state parliament in Dresden, the NPD remains on the fringe of today's German politics. To be on the safe side, though, Düsseldorf parade director Hermann Schmitz did not allow the float to be unveiled until 20 minutes prior to the start of the parade to prevent any neo-Nazi sabotage of the Hitler image. 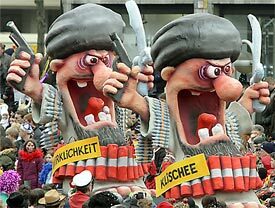 The float in Düsseldorf likely to be considered the most controversial depicted the widespread public image of Moslem clerics by displaying a cleric labeled "cliché" armed to the teeth with a pistol, bullets and explosives. Next to him on the float was an identical Moslem cleric labeled "reality". While it is highly unlikely that Düsseldorf's muslim cleric float will produce anything like the Mohammed cartoon controversy when a Danish newspaper published satirical images of Mohammed, the result will also not be improved relations between Germany's Muslim community and the German people. The secretary of the Muslim central committee in Germany, Aiman A. Mazyek, wasted no time in criticizing the depiction. "That doesn't have anything to do with humor," he said in Cologne. Mazyek, who was born in Germany, interpreted the float's real message in an interesting way: "We love our prejudices, we defend our prejudices – if need be with outright lies." This year's Rosenmontag parade in Düsseldorf was the political highlight of a day of parades and all-day parties throughout the Rhein River area and elsewhere in Germany.